Below are the remarks of John Podesta, Chair of the Center for American Progress Action Fund, as prepared for delivery at a CAP Action Fund event on July 23, 2013. Good morning and welcome to the Center for American Progress Action Fund. 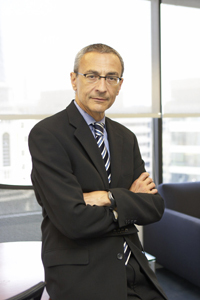 I’m John Podesta, Chair of the Action Fund. I’m very pleased to welcome Sen. Ron Wyden of Oregon to talk about one of the defining challenges facing the United States today—that is, how to reconcile the tension between personal privacy and national security. We are particularly glad to have Sen. Wyden here today because of his long and outspoken history on this issue. In 2006 Sen. Wyden was one of only 10 senators who voted against reauthorizing the PATRIOT Act. This year, of course, he pressed Director of National Intelligence James Clapper in a Senate hearing about whether the government collects any kind of data on Americans’ online activity. That hearing was just a few months before the recent revelations that resulted from the Snowden leaks about the extent of the National Security Agency’s domestic surveillance capabilities and practices. Sen. Wyden has consistently been a thoughtful and forceful voice speaking out in support of constitutional principles and on behalf of the rights of average Americans, and I’m looking forward to hearing what he has to say to us today. But I want to first offer a few brief reflections of my own on surveillance and privacy, a topic which I’ve been working on for quite a long time. In 1984—the real year, not the book—when I was working for Pat Leahy, we sent a letter to the attorney general asking whether the 1968 Wiretap Act—Title 3 of the Omnibus Crime Control and Safe Streets Act—applied to electronic mail and other forms of electronic communications. We heard back from the deputy attorney general, who said the answer to that question “was neither clear nor obvious.” That—and Sen. Leahy’s dedication to the issue—led to the passage of the Electronic Communications Privacy Act, which updated the law in light of new technology. Today we are once again faced by rapid technological change that has simply swamped our existing legal regime. The media’s focus in recent weeks has circled almost exclusively around Edward Snowden’s attempt to earn the world record for longest airport layover. But the individual focus on Snowden, I think, distracts from what is most problematic about the information he provided to the media. That is, unlike the last time we had a national conversation about the NSA and domestic surveillance during the days of “warrantless wiretapping” in 2005, a legal framework exists today to support PRISM and the other programs recently brought into public view. This time, the challenge isn’t rooted in the NSA overstepping its legal boundaries. Instead, new products and services, increasing processing power, and the decreasing cost of storing huge amounts of data means that surveillance on an unprecedented scale is now not just technologically possible, but it is financially feasible for the first time. I sometimes think of this as the dark side of Moore’s Law. It’s past time for us to begin a new national debate about what we want our surveillance laws to permit, particularly in light of how rapidly technology and society are changing. It’s also time we revisit the issue of intelligence privatization. Since September 11 the intelligence community has outsourced a great deal of work that many Americans assume the government does itself. It’s mindboggling that we have over a million contractors with security clearances, and nearly half a million with Top Secret clearances. These contractors are often paid significantly more than the public employees they supplement, screened with significantly less rigor, and have access to the government’s most sensitive information. Snowden is a spectacular failure in a system engineered to malfunction. Congress should work to ensure that critical intelligence activities are performed by appropriate personnel. These last weeks and months have also made clear that we need better oversight of our surveillance agencies, and that we need increased transparency at the Foreign Intelligence Surveillance Court in particular. The American people have the right to know and understand the laws they live under. We all have the right to be treated as citizens by our government, and to be respected as customers by the companies we buy products and services from. Surely, we can meet our national security needs without sacrificing the respect for personal privacy that has long been a hallmark of American life. Finally, because these issues are so technologically complex and go to the heart of the constitutional protections we most cherish, we are recommending today that President Obama establish a national commission to examine these challenges in full. Presidential commissions have a long history of thoroughly and impartially investigating many major national security issues, from Pearl Harbor to 9/11. The commission should be tasked with offering recommendations for a flexible legal framework that can easily accommodate technological advances while maintaining respect for civil liberties. But the commission should not only examine NSA surveillance activities and the laws governing them, but also private-sector activities and telecommunications technology more generally. The NSA programs that came to light in June rest in part on a foundation of personal data collected by private corporations, and governed by those lengthy terms-and-conditions agreements that you click “OK” to without a second thought. Smartphones with built-in GPS technology track their users’ locations, social networks use personal information to sell ads, and phone companies collect metadata on every call made in the United States. What was once thought of as “transactional data” and not “content” can today be used to develop a penetrating profile of any American. This won’t be an easy debate to have. But the difficulty of the conversation is, I think, just one more reason why we need to begin today. And it’s one more reason why I’m glad to have Sen. Wyden’s leadership on this very important set of questions. After Sen. Wyden offers his remarks, Rudy deLeon, Senior Vice President of the National Security program here at the Center for American Progress Action Fund, will moderate a question-and-answer session. Sen. Wyden, the stage is yours. John Podesta is Chair of the Center for American Progress Action Fund.